There’s a chance that this was my last rep performance at the Staatsoper this season, so it’s a shame I have to go out on a mediocre note. This revival of Falk Richter’s dire production is notable and perhaps worth seeing for Peter Mattei’s stellar assumption of the title role. But this isn’t really a star vehicle opera. I guess some people can overlook the incoherence in rest of it more easily than I can, but I didn’t find it a satisfying experience. Maija Kovalevska’s Tatiana isn’t that bad, though. 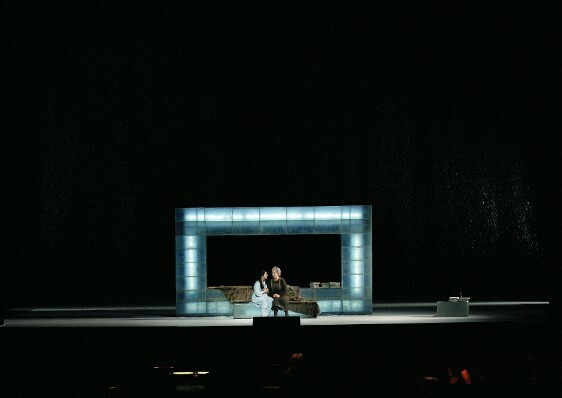 Chaikovsky, Eugen Onegin. Wiener Staatsoper, 6/11/2011. 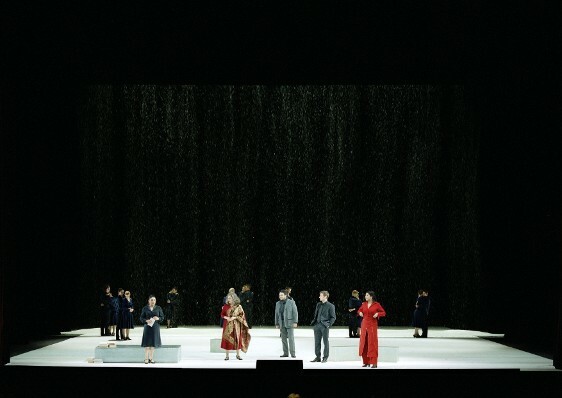 Production by Falk Richter (revival), conducted by Michael Güttler with Maija Kovalevska (Tatiana), Peter Mattei (Onegin), Marius Benciu (Lensky), Ain Anger (Gremin), Nadia Krasteva (Olga), Zoryana Kushpler (Larina), Aura Twarowska (Filipjewna). Falk Richter’s production is a grab bag of clichés that come and go. The one constant is an awful lot of falling snow in nearly every scene. Dress is modern, set is minimal, and blocking is static. Color symbolism, imaginary characters and doublings, and really annoying acrobats are combined into a static, chilly mix that shows little interest in the story and characters, or any sensitivity to the music at all. At first, we see doubles of Tatiana with a mystery man as frozen couples in the background, and the happy peasants also seem to belong to her fantasy world, identifiably by its, um, romantic navy blue business suits. The more practical characters wear red. If anyone wants to make this red mean something obviously significant and Communist, I would first caution you that this production doesn’t seem to have anything to do with Russia at all. The blue plus red plus white snow does look like a Russian flag, though (after my Italian flag the other week). Also, he forgets about all this after Act 1. Act 2 features a truly dreadful party scene that includes awkwardly enthusiastic attempts at current dance styles by the chorus, further flips by said acrobats, and, because we’re in Austria, some people in puffy shiny dresses waltzing (Tatiana incongruously wearing diva-approved long sleeves). I kind of liked Monsieur Triquet as a faded rock star, but like everything else he doesn’t have a point. Act 3 involves lots of people in black walking up and down stairs quite slowly. 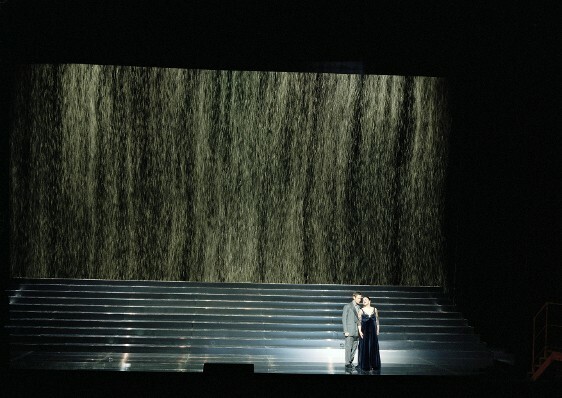 I was hoping Tatiana or Onegin would rip off her bedazzled shower cap, but they didn’t. That would have made everything a little more exciting and less Norma Desmond-looking. I could go on, but I’ll try not to, because the main sin of this production is that it is not interesting. The lighting design is also far too dark at times, including a Letter Scene that while not too dark is lit entirely from the back (see above), the lack of front light means you can’t see Tatiana’s face clearly. OK, I’ll stop. For two lead singers, both new to this production and in fact making their house debuts, the staging offered little help in terms of characterization, and while both showed good acting skills they ended up a little underdeveloped and generic. Maija Kovalevska cuts a pretty figure as Tatiana and is a good actress, within the unfortunate strictures of this production. I never warmed to her metallic, tense sound and fast vibrato, but her singing was musical and rock solid secure, and she can manage impressive power in her upper register. On the other hand, Peter Mattei is seemingly incapable of making a less than beautiful sound, with a chocolately baritone that he never forces (his voice is not large but it is well-projected). His Onegin went on a clear journey from arrogance (Act 1) to boredom (Act 2) to despondency (Act 3), but I think he was much better in this Salzburg production available on DVD. Michael Güttler conducted a rushed account of the prelude followed by an ensemble in which the sisters’ offstage singing had little to do with whatever the harp was playing in the pit. It got a little better. Being too tough on Güttler would be cruel since he probably didn’t get any rehearsal, but this was not good and the orchestra was not trying very hard. In the rest of the cast, Marius Brenciu was a thin-toned, underacted Lensky, though his pp account of the aria’s second strophe was nice. Ain Anger is the youngest and least crusty Gremin this side of René Pape and sang lyrically and not so giant Russian-ly but well. As Olga, Madame Larina, and Filipjewa, Nadia Krasteva, Zoryana Kushpler, and Aura Twarowska showed that the Staatsoper ensemble has a smashing group of Slavic mezzos and altos, all three of them outstanding. Somewhere there’s got to be an opera by Cui or Dargomyzhsky or somebody that has three lading mezzo/alto roles for these impressive ladies. If you want to go hear them in Onegin, well, you can do that too. Performances remain on June 10 and 13. Mattei is a terrific Onegin on the Salzburg DVD and while this may not have been in every respect his best performance he is someone who is at least unsurpassed and rarely if ever equaled in his fach. Almost certainly the best piece of Viennese casting this month*. Pretty amazing that this is his Vienna debut as he's been around at a pretty high level for almost 15 years (I was shocked when I read that this would be his WPO debut in his bio for the Met's QoS). Kovalevska's on the other hand, is here a Vienna debutant at a much earlier stage in her career. Moreover, she's been a regular at the Met, with multiple appearances in various roles for the last 4 seasons with a lot more coming up and has also done quite a bit in places like Munich with NI and the like. This is all the more surprising as your description of her singing is, unfortunately, consistent with what I've observed in the various occasions I've heard her at the Met. I've been surprised when she has received absolute raves from some usually discerning quarters. *Well, 'cept of course for the QoN of your twittering bete noire/occasional namesake Julia Novikova. Kovalevska has a decent amount going for her, she's a good actress and musically solid, but I just can't find her sound attractive. For me that's a deal-breaker; it may not be for others, though. I like Mattei a lot and while he was good it's just really not Onegin's opera and he could only do so much under these circumstances. I wish I could have seen him in Queen of Spades–it's a nothing role but that aria must have sounded fantastic.